I love that every new year we can just pretend like last year wasn’t a thing. And then by February it’s all forgotten again. So consider this my little song and dance to celebrate our agreed upon starting over point. I will pretend that I will start blogging regularly! I will state that this year will be different and I will do my data entry monthly (rather than yearly). I will chose a grand knitting project that will be just for me and then I’ll never get started on it. This sounds like a lot of excuses. But really I just know myself well enough that I accept my failings as a human. I’m a big talker, but not much of a doer. One thing I did do already this year was to reorganize my dresser. Apparently there is a book circulating that addresses clutter and how to get rid of it. I didn’t read or even pick up the book, but I saw a snippet about it on a news show. They mentioned something about folding your clothes so that you can see every article in the drawer. 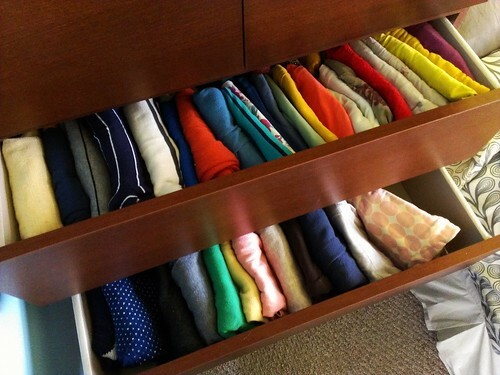 It sounded like an interesting concept, but I worried that my clothes wouldn’t fit in the drawer once I refolded them. So I began slowly with the pants drawer. Everything still fits! The next week I moved onto a shirt drawer. Still fits! And I could see everything at once! It was really quite exciting. I ended up doing all the drawers and was pleased to discover that everything went back into its drawer and the new folding technique utilized the space better. Since I got this dresser six years ago, I have never been able to arrange my clothes in a way that used all the space. It annoyed me. But now all the space has been filled and I can see each sad, dull garment I own all at once. My personal color scheme is quite dreary. The one thing that I found odd about this is that your clothes are now standing up and when you take an item out, or the drawer isn’t full, the garment on the end sags. I feel like I need book ends just to keep everything in its place. Ah well, still a successful endeavor! I’ve been thinking about this blog a lot, feeling bad that I have neglected it, wondering why I continually avoid posting. Here is what I have determined. 1) Nobody blogs anymore. Nobody reads blogs anymore. If I am going to continue with this, I should do it because I want to document things, not because I am trying to entertain someone. 2) It’s so time consuming! You need a topic and photos and stuff and blah and I just don’t want to. But on the other hand, there are times when I really want to express myself in something longer than a Facebook post. I don’t know why I find it so much more of a burden to pop over to WordPress and type up a little post. I suppose I figure it out to be more polished and professional. Must it? 3) What do I have to say? That hasn’t already been said. I feel like my life is on repeat, so how do I present my activities in a new way? To me it’s the same thing again and again. Yep, I went to work. And again today. And again. And again. I don’t know how to make it fresh and relevant to the topic of “fiber”. I’m sewing modern clothes! I want to talk about that. So, with that being said… what’s next?